Ligament injuries – ACL (anterior Cruciate Ligament) and MCL (Medial Collateral Ligament) injuries are common in contact sports, skiing and even dancing! Muscle strain – of the muscles which support the knee such as hamstrings, calves and quadriceps. Anterior Knee Pain – caused by malalignment of the knee-cap causing grating of its underside on the thigh bone (femur) below – this causes pain particularly in prolonged sitting and climbing stairs. 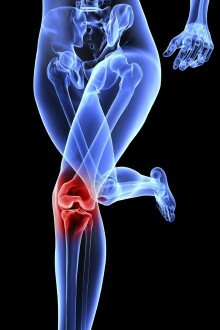 Patella tendonitis – inflammation of the tendon below the knee cap typically seen in runners, jumpers and endurance sports. A form of this problem seen in children is known as Osgood-Schlatter’s disease. You may be asked to walk/run on a treadmill (if able) to assess gait and running style. A diagnosis will then be discussed with you and a treatment plan outlined – treatment will then start immediately, during that first session. If we suspect a torn ligament or meniscal cartilage we can refer you directly to experienced and highly reputable knee surgeons. If the biomechanics of your feet are a causative factor we can refer you directly to our Musculoskeletal Podiatrist (link to Podiatry page at TLC) for the provision of orthotic insoles.